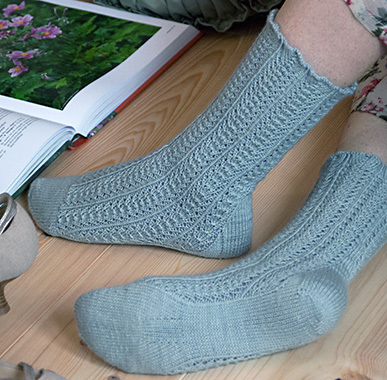 As every sock knitter knows, hand knitted socks are addictive, both to knit, and to wear. These socks were born from the need for cosy, comfortable socks that are elegant enough to be worn with dress shoes. Because once you've tasted the luxury of hand knitted socks, you never want to wear anything else, right? 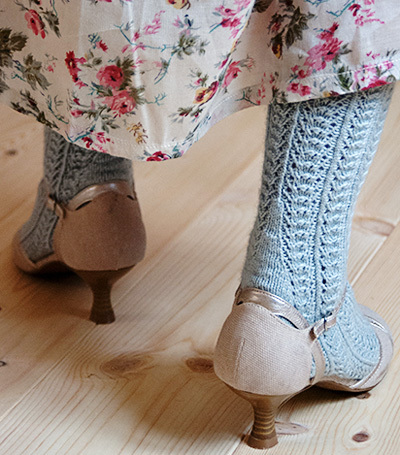 Dressy is a very feminine lace sock, with details borrowed from old fashioned nylon stockings. A slightly ruffled edge leads down to the lace pattern. Halfway down the back of the leg, the line of twisted stitches expands into a gusset for the heel. The gusset continues into a small heel flap. Rapid decreases continue the line from the heel gusset. The sole is narrow, and thus virtually invisible when wearing more open shoes, like sandals. Closer to the toe the sole increases, for comfort and a beautiful line. A simple, unobtrusive toe finishes the sock. The heel construction, a mix of traditional heel flap and gusset style heel, is a bit unusual, but gives an elegant and very comfortable sock. 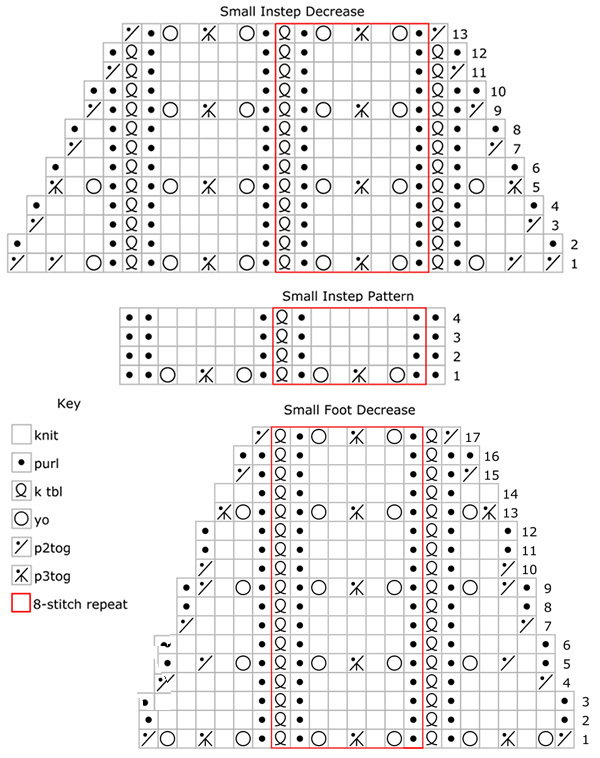 The lace pattern is only four rows and very easy to memorize. Description and photo tutorial can be found here. Video demonstration can be found here. To resize the sock foot: For longer or shorter socks, work the section between the Instep decreases and the Sole increases longer or shorter. CO 98[112, 126] stitches using the purled long tail method. Distribute the stitches as you prefer, and join for working in the round, being careful not to twist. Rounds 1-2: [P1, k11, p1, k1tbl] around. Round 4: [P1, k9, p1, k1tbl] around. Round 6: [P1, k7, p1, k1tbl] around. Round 8: [P1, k5, p1, k1tbl] around. Leg round: Work Lace pattern around. 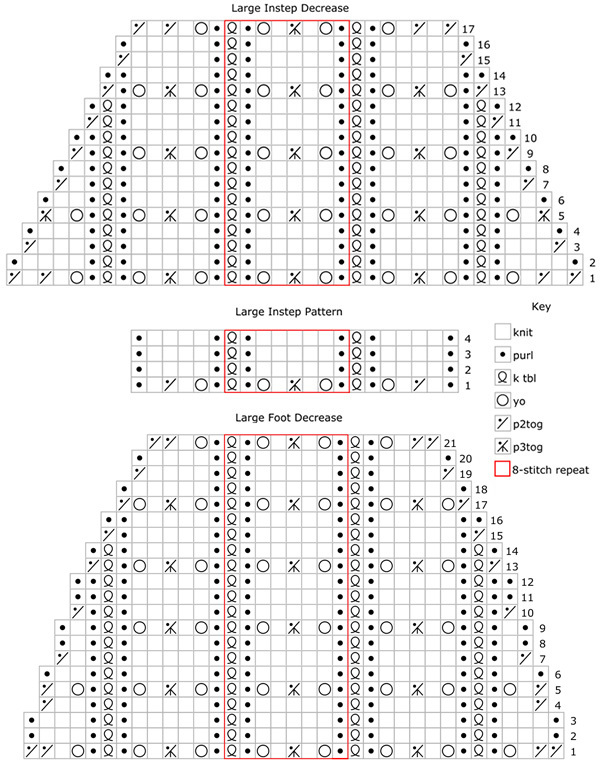 Work as set until leg measures 4 inches/ 10 cm, ending with Row 1 of the Lace pattern. Rounds 2-12: Work Lace pattern to marker, p1, k3. 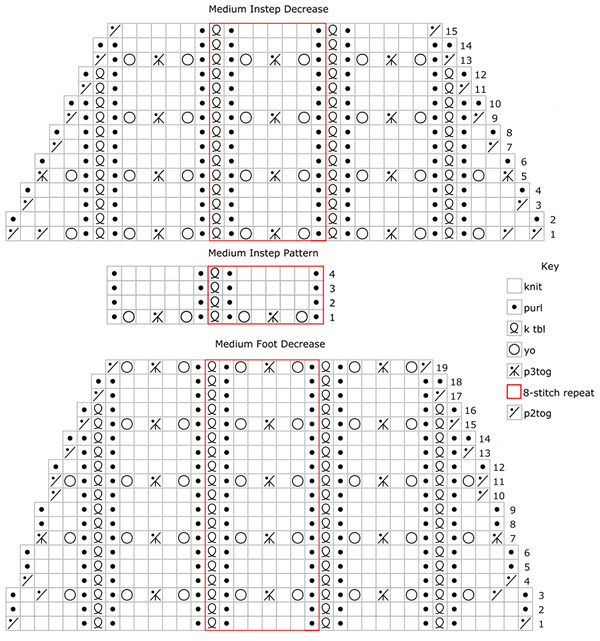 Rounds 14-21: Work Lace pattern to marker, p1, k5. Rounds 23-25: Work Lace pattern to marker, p1, k7. Round 26: Work Lace pattern to marker, p1, RLI, k to end of round, LLI. 2 stitches increased. Rounds 27-28: Work Lace pattern to marker, p1, k to end of round. Turn so that WS is facing. The heel is worked over the 19[21, 23] gusset stitches. Remove marker. Row 1[WS]: Sl1, p 18[20, 22], turn. Row 2[RS]: Sl1, k18[20, 22], turn. Repeat Rows 1-2 8[9, 10] more times. Heel row 1 [WS]: Sl 1, p11[12, 13], p2tog tbl, p1. Heel row 2 [RS]: Turn, sl 1, k6, k2tog, k1. Heel row 3 [WS]: Sl 1, p7, p2tog tbl, p1. Heel row 4 [RS]: Turn, sl 1, k8, k2tog, k1. Heel row 5 [WS]: Sl 1, p9, p2tog tbl, p1. Heel row 6 [RS]: Turn, sl 1, k10, k2tog, k1. Size S only: Proceed to Gusset. Heel row 7 [WS]: Sl 1, p11, p2tog tbl. Heel row 8 [RS]: Turn, sl 1, k11, k2tog. Heel row 7 [WS]: Sl 1, p11, p2tog tbl, p1. Heel row 8 [RS]: Turn, sl 1, k12, k2tog, k1. The heel now has 13[13, 15] stitches. Rep Decrease round 6[7, 8] more times. 15[17, 19] sole stitches remain; 70[80, 90] stitches total. Next round: K to 1 stitch before instep, k1tbl, work in pattern over instep stitches, k1tbl, k to end. The decreases will now be worked at the beginning and end of the instep, while the lace pattern continues on the remaining instep stitches. Next round: K to 1 stitch before instep, k1tbl, work Instep Decrease Chart for appropriate size across instep sts, k1tbl, k to end. 68[78, 88] stitches. Continue as set until all Instep Decrease Chart rows are complete. 56[64, 72] stitches rem, 41[47, 53] on instep. Foot round: K to 1 stitch before instep, k1tbl, work Instep Pattern for appropriate size starting at Row 2[4, 2], k1tbl, k to end. Work even in pattern for 22 more rounds (1.75 inches), or until 2.75[3.5, 4] inches short of full foot length. Note: if you are adjusting length, ensure you end with Round 4[2, 4] of the Instep pattern. Increases will now be worked on the sole, with corresponding decreases on the instep, while the lace pattern continues on the remaining instep stitches. Increase/Decrease Round: K2, RLI, k to 1 st before instep, k1tbl, work Foot Decrease Chart for appropriate size, k1tbl, k to last 3 sts of round, LLI, k3. Next 2 rounds: K to 1 st before instep, k1tbl, work Foot Decrease Chart for appropriate size, k1tbl, k to end of round . Repe at the last 3 rounds three more times. Following round: K2, k to 1 st before instep, k1tbl, work Foot Decrease Chart for appropriate size, k1tbl, k to end of round. Repeat the last two rounds 1[2, 3] more times. Work Increase/Decrease Round once more. Repeat the last 4 rounds once more. Repeat the last 3 rounds once more. Repeat the last 2 rounds 1[2, 3] more times. Work Decrease round 3[4, 5] times. 20[20, 20] stitches. K 3[3, 3]. Slip 10[10, 10] stitches onto one needle (front stitches) and 10[10, 10] stitches on another needle (back stitches). Graft toe closed and weave in the ends. Maria is a devoted sockaholic who is starting to become addicted to lace. One can never have too many socks, and lace works with everything, so what is better than lace socks? Having a somewhat anachronistic taste, she constantly tries to translate vintage style into knitted items. Further proof can be found on her website and her blog. 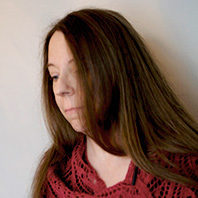 On Ravelry, she is marianaslund.